David Driskell: In Search of the Creative Truth is a story about one of today’s most important artists and leading authorities on African American art. This film captures Driskell making collages inspired by mentor Romare Bearden, documents him with National Gallery consulting curator Ruth Fine, and painting at his Falmouth, Maine studio. 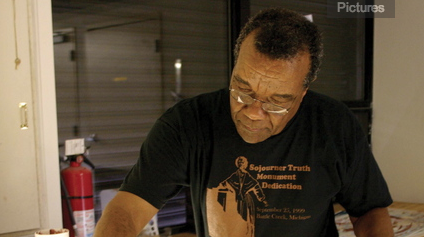 The film also explores the give and take of his creative relationship with master printmaker, Curlee Holton. It all results in powerful works that pull from abstract expressionism, African masks, Coptic art, modernism, cubism, and the history of art. • September 30, 2012, 11 am, Farnsworth Art Museum, Rockland, ME (part of Camden International Film Festival). David Driskell and Museum Director Richard Kane will present the film. • April 26, 2013, 6:30 - 7:30pm, Schomburg Center for Research in Black Culture, New York, NY. David Driskell will offer remarks and answer questions.